In total, 114 inmates between 20 and 75 years-old at the La Picota prison saw the team. 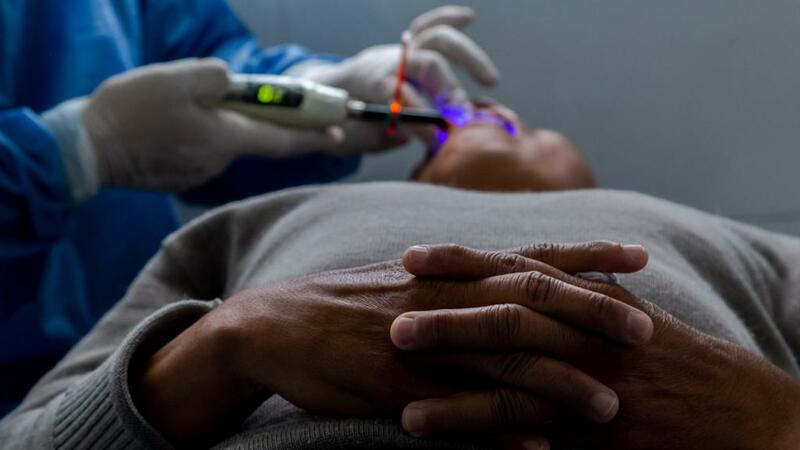 41 were provided with dental care. Esaú Duarte Durán, a support professional from the Department of Medicine and Occupational Health at Los Andes leads the training session in first aid and emergency care. Three groups belong to the Uniandes Volunteer Program: the student team, the Eres Colombia Foundation, and the Tu sirves foundation. 53 prison healthcare agents –leaders from each wing– attended the first aid and emergency care training session. 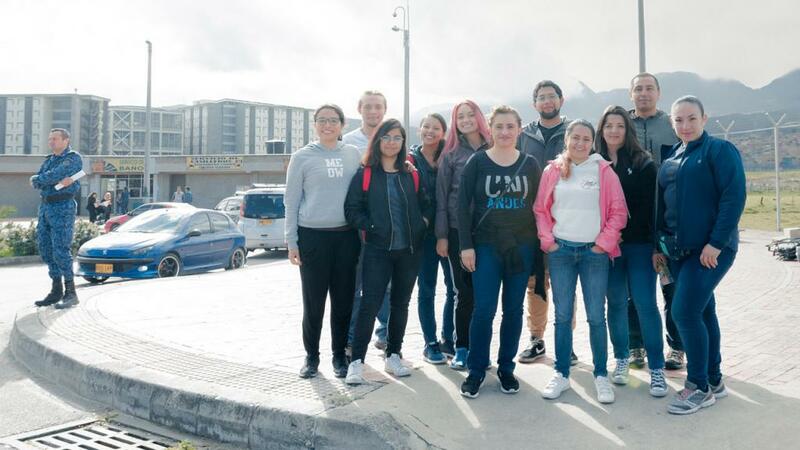 From 8 am until 3 pm, the 21 volunteers, both students and administrative workers from Los Andes, including odonatologists, physiotherapists, and experts in first aid participated as part of the team. César is surrounded by sadness. He thinks about his loved ones, averts his gaze to the ceiling, and within just a few seconds, his eyes are flooded with tears. “It is hard because I’m not from here and I don’t have my family’s support”, he says. This man from Tolima’s happiness fell apart nine years ago when he was imprisoned in the La Picota Penitentiary and Prison Complex in Bogotá. That was one day he says he would prefer to forget. 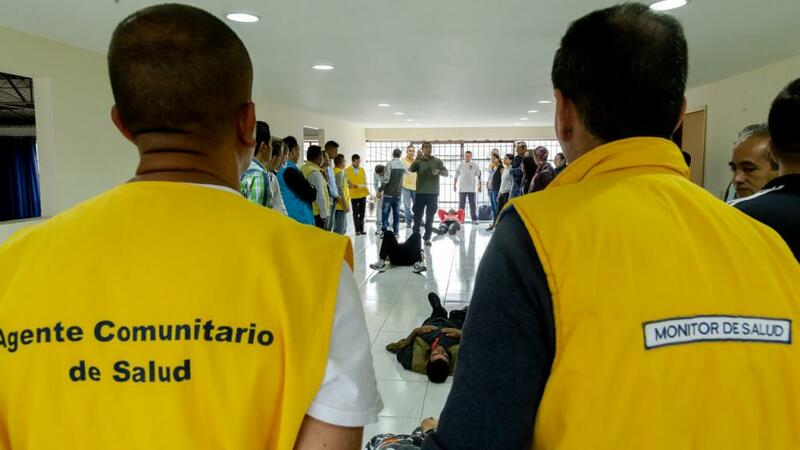 It is 8 am, and a team of 21 volunteers have just entered the prison, both students and administrative workers from Los Andes, including odonatologists, physiotherapists, and experts in first aid. “A professional becomes stronger by living these experiences because s/he finds out the true meaning of service”, said Mariana Castaño Leudo, who graduated in Industrial Engineering from the Universidad de los Andes with a distinction in university social responsibility. She is also the cofounder of the Tu sirves Foundation, which, together with the Eres Colombia Foundation, joined the Uniandes Volunteer Program to visit the prison and be part of the health and first aid team. The session was held in two stages: the first was the training session in first aid (in a room near the chapel), and the second was health care provision – physiotherapy in the gym and odontology. “I only have a little time left inside here”, yearns César who dresses impeccably as if he is waiting for a relative’s visit. “I have a sister in Bogotá, and she comes frequently”, expresses the 38 year-old. Behind a barred gate that is watched over by an INPEC guard, the inmates patiently wait their turn. A stocky man opens the gate, removes the chain, and allows the prisoners to enter. César is one of the first. Meanwhile, in another area of the prison, in a space adapted for physical activity, between stretchers, weights, and some stationary bicycles, the physiotherapist Doris Castañeda rubs emulsion gel on her hands to calm prisoners’ pains. “Many of them need therapy. They have fractures, bruising, and other injuries. The problem is that, sometimes, the processes here can take a long time and this leads to complications with the injuries”, she says minutes after massaging a prisoner’s back that is tattooed with San Miguel the Archangel who is considered to be the advocate of the people as chosen by God. At the same time, the first aid training was taking place in the room near the chapel. “You need to hug them tightly from behind”, Esaú Duarte, a support professional from the Department of Medicine and Occupational Health, says in a loud voice. 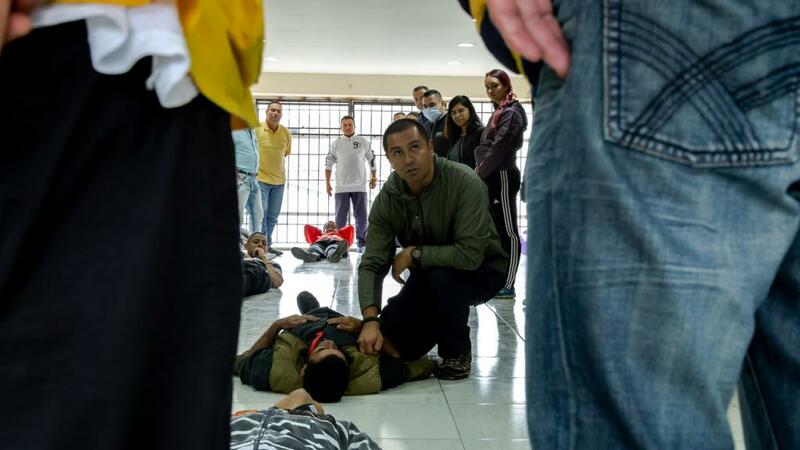 He is simulating different situations that can be a risk for prisoners´ lives such as fainting due to a blow to the head, a fight, a riot, or an accident inside the prison for the 53 health promoters –leaders from each wing– who attended the training session. “For example, if a fellow prisoner convulses in the queue while you are being counted, you have to grab him quickly, make sure that he does not bang his head, and then make sure he has vital signs. I didn’t know this”, says Edwin. He is a health promoter from Wing 3 who looks out on a daily basis for his fellow prisoners’ wellbeing. He also keeps a register of inmates who require medical care, and from now on, just like the other leaders, he must use what he has learnt in the session to promote prisoner care and survival in the event of an emergency. “It was a very interesting activity that demonstrated the great potential there is to contribute to society by having a knowledge of these issues”, said Durán – the training leader who highlighted the participants’ excellent attitude and enthusiasm. César has already left the consulting room. 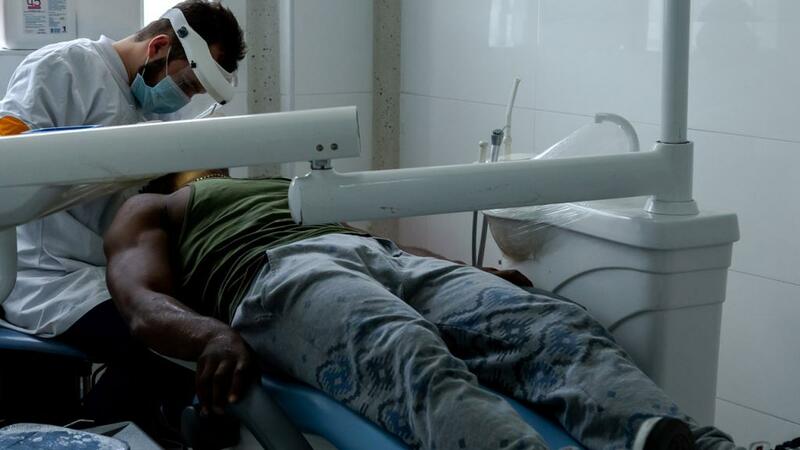 The orthodontist who treated him felt proud: “Look at him, he looked at himself and he was surprised” he said while César was looking at himself in the mirror. “He came here with no teeth but left with a few. That is satisfying”, he concluded. The incredulous César does not stop looking at himself. “I am really happy because this is my image. Thank you so much”. He says goodbye and then goes back to Wing 7 with an indelible smile. He is going to wait for his sister to come back to show her his new teeth. The gate creaks shut and the guards lock it with a padlock.